AND SKILL COMES WITH REPETITION AND REVIEW. 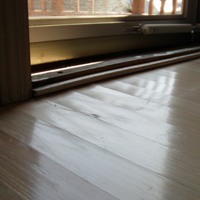 The Wood Floor Conservancy exists to proactively help floor owners avoid the problems that lead to repairs. It is our strongest recommendation that you first confer with a Floorwright in your area before attempting any repair on your own. Very quickly things can go from bad to worse. 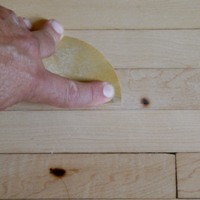 Many pre-finished floors simply can't be sanded. The 2 mm hardwood wearlayer simply won't survive. the nails are exposed and the boards are splintering. 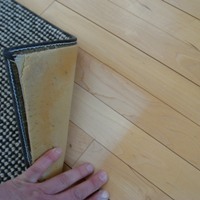 If a new floor is not in your budget, then you may be looking at cosmetic fixes. The Conservancy recommends repair over replacement always as the first option, once the damage is done. If a long-lasting or visually acceptable result simply can't be achieved, then replace. 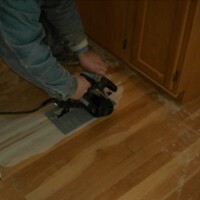 "We can always get more..."
Short of a complete tearout and replacement, you might harvest flooring from a less conspicuous area for the wood floor repair. Plan on 30% waste as you consider your options. So, for example, if you have 100 square feet of flooring to be harvested, plan on that being sufficient for 70 square feet of repair. 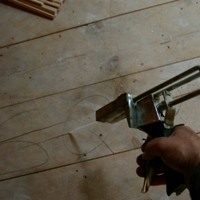 In the following video, I am cleaning up the joinery of a pre-finished flooring board for re-installation. Joint-glued, engineered flooring is a thing of the past. Pre-finish mills mostly produce click-together, now. Yet, there are acres of joint-glued, pre-finished flooring all across the country. I could not have repaired this engineered hardwood floor with new material--none exists. Likewise, I couldn't have harvested this flooring in a useable state without the router table and router bit to clean glue out of the joinery, first.